Contrary to neighbouring Norse communities in Iceland and Greenland there are no written records on pre-Reformation church sites in the Faroe Islands. Thus such sites are only reflected in folklore, sparse visible archaeological remains and place-names often containing the Faroese term “Bønhús” (English: prayer-house). While around the mid-19th century ruins of this type of church sites could be seen on numerous places around the islands, today only a handful are visible. 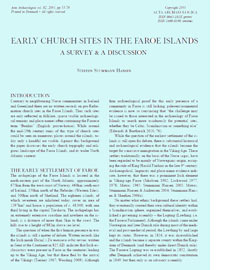 Against this background the paper discusses the early church topgraphy and religious landscape of the Faroe Islands, and its wider North Atlantic context.